Staying at the lovely Conrad hotel overlooking the Hudson River at Battery Park (see my river view pics here), we wanted to eat Sunday lunch nearby on the last day of our New York trip. 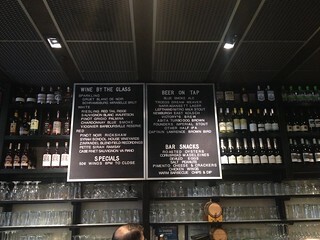 Blue Smoke, a Southern BBQ smokehouse, just around the corner on Vesey Street was convenient, appealed (as in – when in the U.S., make the most of good American cusine) and served craft beers too. 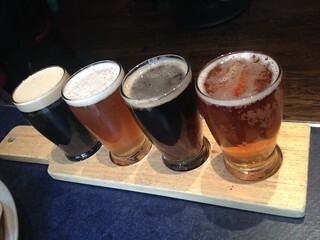 From the drinks menu, K had a root beer (tastes like medicine) and I had a ginger crush (ginger beer with orange, lime, soda and thyme – nicely refreshing), followed by a flight of four 5oz beers to share @ $15.00. 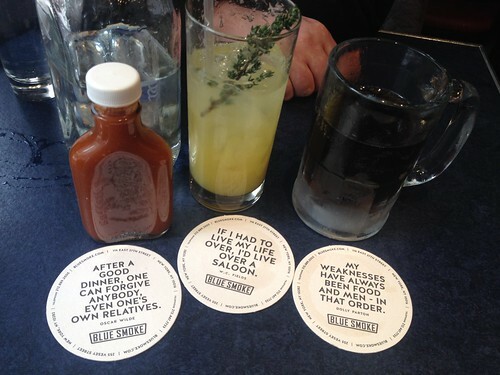 From the Southern lunch menu, we both chose a pit stop: one meat, one side and one sweet for $20.00. Plus an additional meat @ $5.00. The meat choices were pulled pork, 7 pepper brisket, baby back ribs and backyard chicken (K chose the first two, and I chose the latter two). The side dish options were mac & cheese, collard greens, sweet potato mash and BBQ baked beans (K chose the first, I chose the last). 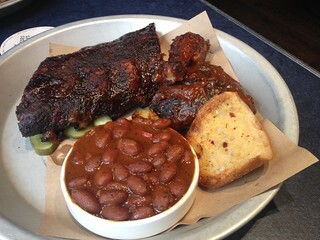 My ribs and sticky chicken were as good as they look in the photo, as were the barbecue beans. 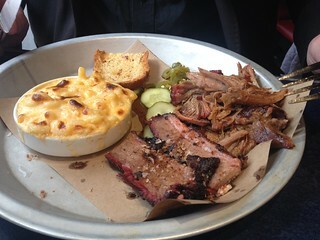 The mac & cheese was well done and K enjoyed the pulled pork and peppered brisket (slightly dry though). The crispy bread was superfluous (and again, a bit dry). For the ‘sweet’ included in the pit stop, we chose a cookie and a brownie to share. Both arrived in packaging – no frills style, ready to take away. The verdict: Excellent value @ $25.00 (about £17.00) for such a big meal. 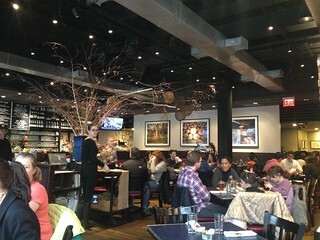 Simple but good Southern food, with really good service and a very appealingly furnished interior.